Sponsored by Campus Ministry, FaithWorks is a service-immersion program in Providence, R.I. for incoming freshmen at Providence College. FaithWorks 2019 will take place from Saturday, August 17 through Thursday, August 22. All participants must arrive on campus by 11am on Saturday, August 17 to move into their assigned residence hall for the year. The program will conclude on Thursday, August 22 in time for all students to fully participate in the New Student Orientation Program. 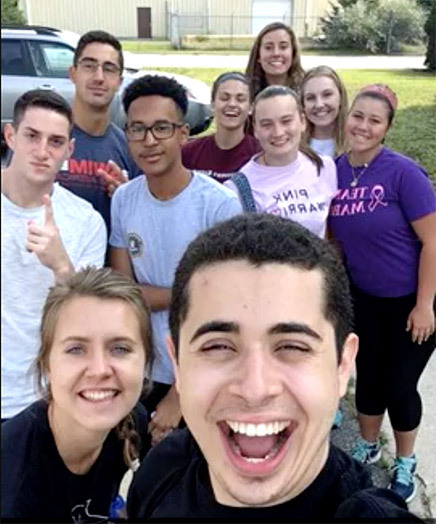 FaithWorks enables new PC students to build community with their peers, perform service work for vulnerable populations in Providence, and reflect on the significance of this work for their lives. The program is facilitated by a Campus Minister and student coordinators in collaboration with many faith-based organizations in the greater Providence area. FaithWorks seeks participants with a diversity of spiritual backgrounds and welcomes individuals of all religions. Through direct service work and conversations in the community, FaithWorks allows participants to understand the city of Providence from the perspective of Catholic social service agencies and the underprivileged residents, groups, and neighborhoods that those programs serve. Last year, FaithWorks participants had the opportunity to both serve and learn at a wide variety of placements connected with the church in Providence: St Pius V Church and School, the Refugee Dream Center, My Brother’s Keeper, Bethany House, the Mother of Life Center, Habitat for Humanity and the RI Department of Corrections. Group reflection is central to the FaithWorks program. Campus Ministry staff and student coordinators will facilitate conversations that ground the group’s service work in spiritual values and beliefs. FaithWorks also includes fun daytime and evening activities in the Providence area. It is a great opportunity to meet other students, learn more about PC and delve into questions about faith and justice. After FaithWorks, participants and student coordinators meet monthly in order to continue supporting one another. These meetings will promote a community of solidarity and service at PC. Student coordinators and Campus Ministers will share the joys and challenges of trying to integrate a life of contemplation and action. Cost: Participation on FaithWorks is FREE! Transportation, accommodations, and meals are included free of charge to all FaithWorks participants. Application: FaithWorks will be limited to 50 incoming freshmen participants. Applications will be accepted on a first-come, first-served basis, so apply soon! Applications will be accepted until Friday, June 28, 2019. Please list any dietary restrictions, allergies, and significant medical conditions that the Campus Ministry staff should be aware of. Please thoughtfully answer questions 1-3 and one of the supplemental questions no later than June 30, 2018. Each response should be no longer than 150 words. We welcome individuals with a diversity of backgrounds and interests. Thus, there is no “right” or “wrong” answer for any of the following questions. We want to get to know you! Again, students will be accepted on a first-come, first-served basis so get your application in! 1. How has your personal history led you to apply for FaithWorks? What is your motivation for applying to this program? 2. What do you hope to gain from FaithWorks and what will you bring to the program? 3. Daily reflection will be central to the FaithWorks experience. Please discuss your comfort level with prayer and group reflection. Please answer one of the following questions. Creativity is encouraged! 5. If you were stuck on a desert island and all of your basic needs were met, what is the one thing you would bring with you and why? 6. What is one of your best childhood memories? In line with the goals of FaithWorks, the leadership team has developed a set of community standards to guide our time together. The following statements constitute that community agreement. Please select the "I agree" buttons to show that you have read, understand, and agree to uphold the following community standards. By participating as a student volunteer for FaithWorks, I am acting as a representative of Providence College and Campus Ministry. As such, I will strive to maintain the highest standards of personal conduct, assuring that my behavior is morally and legally acceptable. I will adhere to all College policies set forth in the Student Handbook and respect all guidelines of our hosts and partner agencies. Mindful that an intentional community is formed by full participation in all activities, including service, meals, and free time, I will abstain from utilizing electronic devices including cell phones, iPods and tablets throughout programmed activities. Student leaders and staff will have phones for emergency purposes only. I understand that the Campus Ministry staff and student coordinators are in over-all charge of FaithWorks, and I agree to respect their authority and decision-making responsibility. I understand that I commit myself to travel, live, and work as a member at all times during FaithWorks and that I will not go off by myself or leave the group without the knowledge of the Campus Ministry staff and student coordinators. I understand that at no time may I be in possession of or consuming alcohol, illegal substances, or drugs of any sort for the duration of FaithWorks.